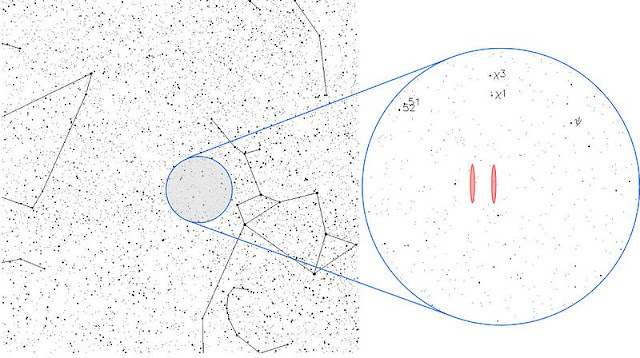 On August 15th, 1977, the Big Ear radio observatory in Ohio was taking part in the SETI(Search for Extra Terrestrial Intelligence) project and detected an anomalous signal from the direction of the Sagittarius constellation. The signal lasted 72 seconds at about 1420.456MHz and was powerful enough to push Big Ear's monitoring device off the charts. 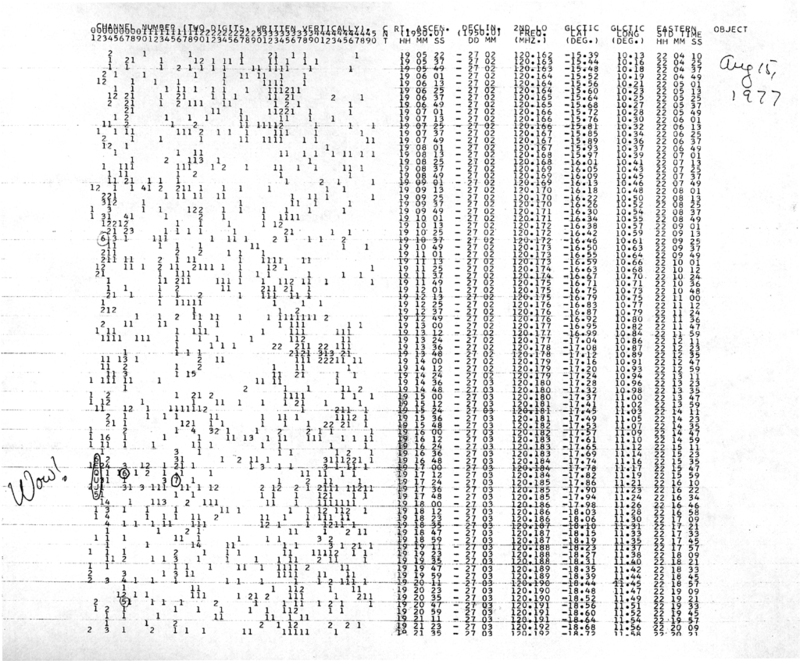 Dr. Jerry Ehman, a volunteer working on the project, circled the corresponding data in the paper printout and wrote "Wow!" in the margin...so it became known as the "Wow!" Signal. Though SETI has focused on the location the signal came from many times for extended periods since then, nothing even remotely like that original transmission has been recorded since, and in fact that area of space has been shown to be very quiet. While it is disappointing that no like signals have been picked up in all that time, the data collected during subsequent listening periods have been enough to rule out the possible "natural" causes for the original signal that were postulated. Of course, that does not mean the signal was artificially generated. It just means we don't know. In an interesting (and definitely NCSI-worthy) development, National Geographic has announced a project that will send crowdsourced messages to any extraterrestrials who may be listening out there. The first part of the experiment will take place on Friday, June 29th(ten days from the writing of this article) and will begin at 8pm EST. For the four hours up to midnight, all Twitter messages tagged with the #ChasingUFOs hashtag will be collected into a database and later compiled into a transmission packet. Then, on Wednesday, August 15th--the 35th anniversary of the reception of the "Wow!" 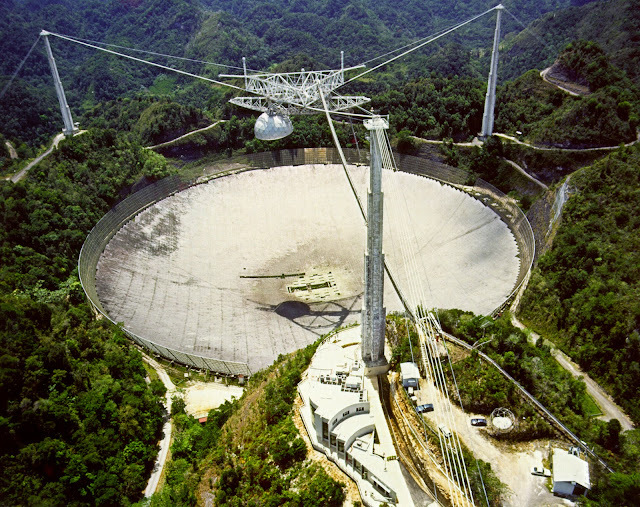 Signal--the Arecibo Observatory Radio Telescope, which has a diameter of one thousand feet and is the world's largest radio telescope, will blast the collected tweets into space. The National Geographic show "Chasing UFOs" is highlighting this 'tweet the aliens' project, calling it the "Wow Reply." Below is a one minute video of the NatGeo promotion for this event. 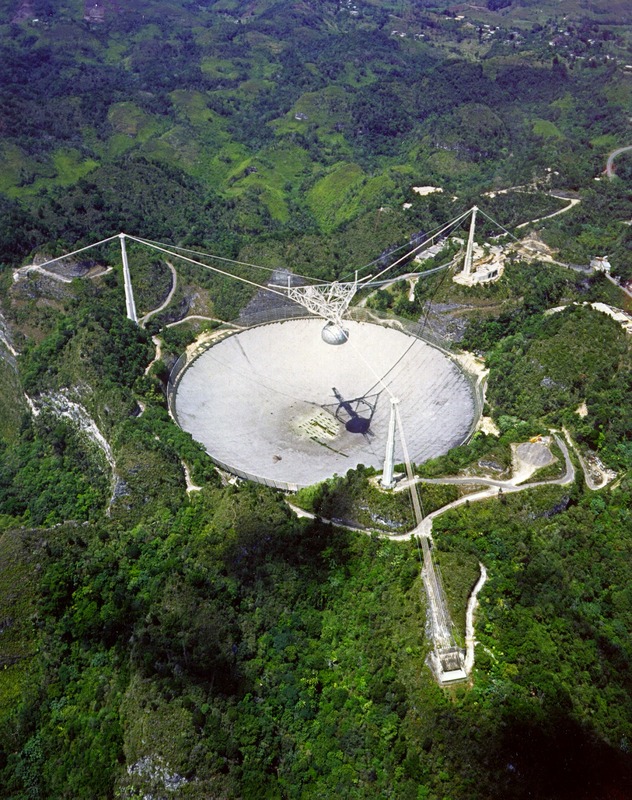 Arecibo has actually been used before as a SETI transmitter instead of just a receiver. In 1974(three years previous to Big Ear's reception of the "Wow!" Signal), some modifications had been made to the Arecibo transmitter, enabling it to broadcast signals at a power of up to 20 terawatts--that's 20 trillion watts--and as an inaugural test of these improvements it was decided by SETI to transmit an encoded message, a message of the kind they had been hoping to receive. 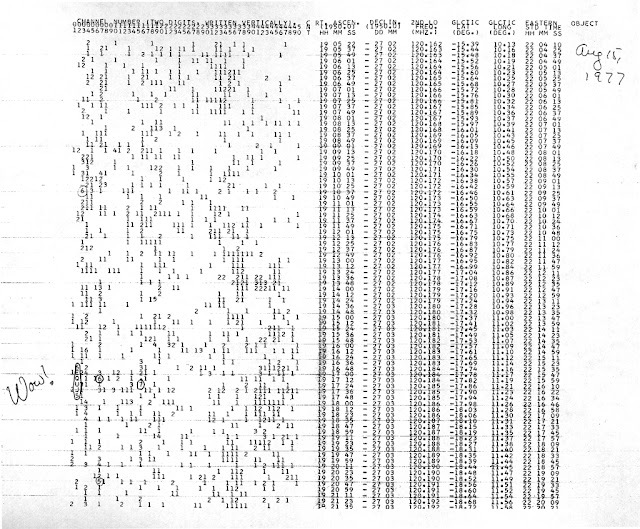 The message was actually transmitted on November 16th, 1974 and consisted of 1679 pulses of binary code which took a little under three minutes to transmit. 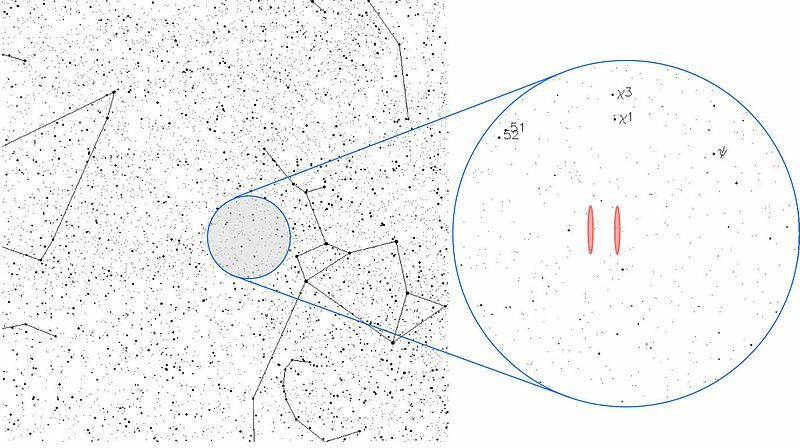 It was transmitted on a frequency of 2380MHz, and was aimed towards the globular star cluster M13, some 25,000 light years away and consisting of some 300,000 stars in the constellation of Hercules. Not very informative? What would a hypothetical "Alien SETI" do if it received this message? Hopefully they would do what our SETI would do: look for a "key" in the data related to the message--frequency, pulse patterns, etc.--by combining the message with that data in different ways. In this case, the first "key" is contained in the number of pulses, 1679. This number was chosen because it is what is known in math as a "unique product," meaning there is only one pair of numbers that, when multiplied together, equal 1679. Those two numbers are 23 and 73, both of which are prime numbers and therefore also a type of unique number. Patterns then become apparent with this configuration, and can be decoded with a little skull sweat. The message is comprised of several sections, each depicting a particular aspect of our civilization. At the top are binary representations of the numbers one through to ten. The numbers eight, nine, and ten each occupy two columns, intending to show that we can specify numbers too large to be written on a single line can be 'carried over'. The next section contains the binary values 1,6,7,8 and 15, indicating the atomic numbers of the primary elements for life on Earth; Hydrogen, Carbon, Nitrogen, Oxygen, and Phosphorus. The larger section of three rows represents the formulas for the sugars and bases in the nucleotides of DNA. Beneath this is a graphical representation of our DNA double helix, on either side of a straight vertical bar which indicates the number of nucleotides in DNA. Directly below the DNA double helix is a small representation of a human. On the left is a binary value of the population of Earth. This can be calculated as roughly 4.29 billion, which was the approximate population of the world in 1974. On the right of the humanoid form is a binary code for the height of humans. Because we cannot communicate measurements (such as feet, inches, centimeters, etc.) 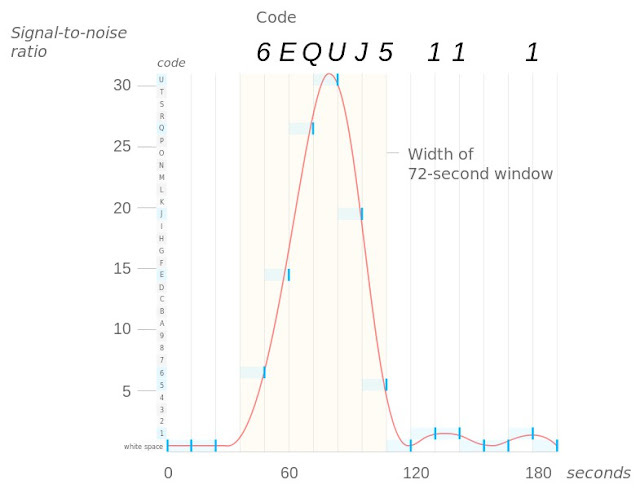 the height is represented in a way that uses the frequency wavelength of the message as another "key." The frequency was 2380MHz, the wavelength of which is approximately 12.6cm. From the code for the height of a human, we can see that the value is 1110 in binary, or 14. 14 multiplied by 12.6cm is 176.4cm, or roughly 5 feet 9 inches - the average height of humans. So when the Alien SETI guys multiply 14 by the length of the frequency wave, they will get the height of humans in terms they can understand, because they will multiply 14 by the length of the wavelength as measured in their own measurement units. So if a 2380MHz wavelength measures out to 34.9 alien inches, they will get the height of humans as 488.6 alien inches, which will be correct because 34.9 alien inches = 12.6cm, and therefore 488.6 alien inches = 176.4cm = 5ft, 9in. The next section is a simplified representation of Sol System. It shows the sun and nine planets, roughly representative of size. The third planet is lifted as a way to highlight it--basically saying "We Are Here." 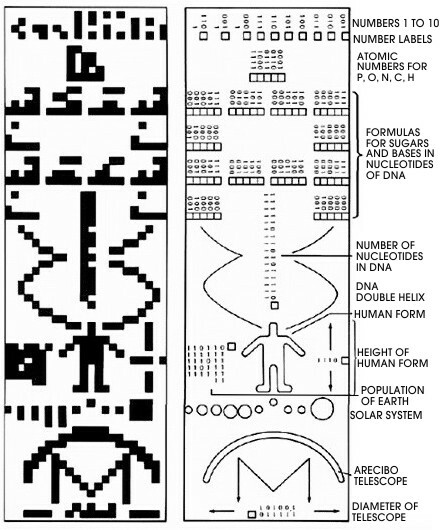 The last section depicts the origin of the message itself - the Arecibo radio telescope, which is the curved structure. Underneath this, as the last two lines of the message, is another binary number. This time it's 100101111110 (split onto two lines) and equates to 2430. When multiplied by the frequency wavelength, it gives the diameter of the Arecibo transmitter dish, which is one thousand feet. Interesting, yes? But wait...there's more! On Sunday, August 19th, 2001, a very interesting crop formation was discovered in a field near Wherwell, Hampshire, in England. 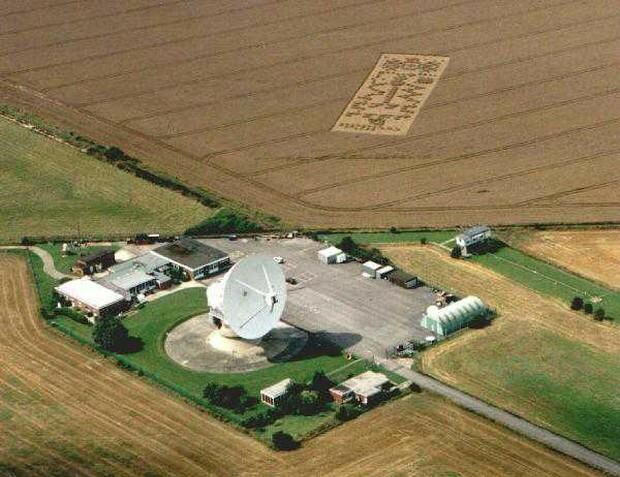 It was found on the grounds of the Chilbolton Radio Telescope Observatory...a fitting place, seeing as it appears to be a "response" to the 1974 Arecibo message. 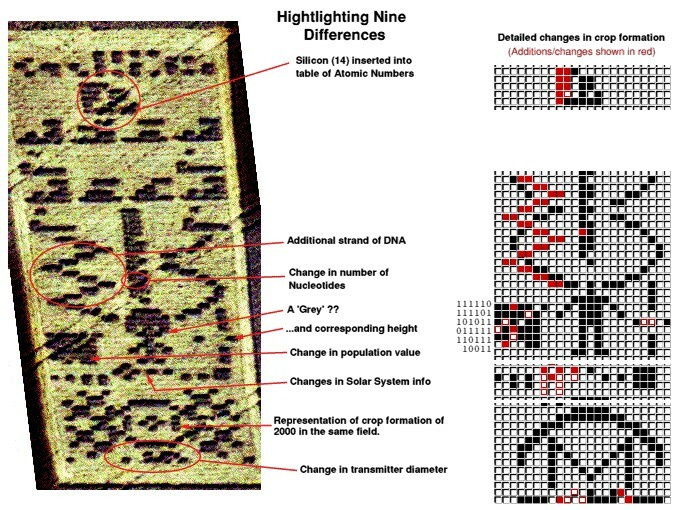 It is immediately apparent that the formation is structured in the same format as the Arecibo message, and appears to convey the same types of information as contained in the Arecibo message--with some differences apparent--and this is why many consider it to be a "reply" to that transmission. Many others, including SETI, consider it to be a hoax. Of course, SETI considers all crop formations to be "hoaxes," meaning their "official" opinion is that crop circles are all made by clever, speedy, sneaky ninjas using ropes and boards. Ninjas with excellent night vision. Ninjas with Ph.D.'s in mathematics and a minor in Vector Graphic Design. 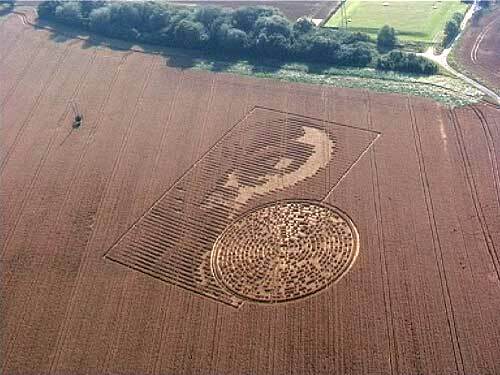 However, we here at NCSI cannot really fault SETI for maintaining this official opinion of crop circles. SETI is in the business of seeking extraterrestrial communications using radio signals from space. If they were to admit the possibility that extraterrestrial communications are currently taking place in images imprinted in fields, it would be difficult for them to continue to justify renewals and increases in their budget allotment. Note that NCSI does not postulate that crop formations are definite alien attempts at communication. Nor are we saying that they are not made by humans. In fact, many crop formations are openly made by humans in the form of advertisements. The creators are paid for their work, and the farmers who own the crop fields are approached beforehand and paid a 'rental' fee for the space. 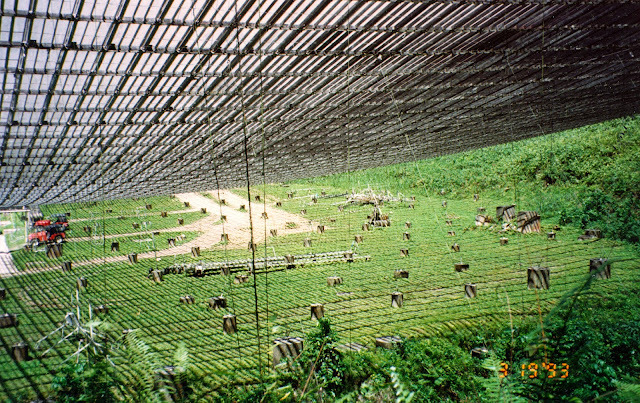 As for the formations that appear mysteriously in fields without permission of the land owners, there are two distinct types: messy trampled ones that break and kill the crops, and clean, perfect ones where the stalks are folded down and woven into patterns as many as 9 layers deep without killing the crops. We are of the opinion that humans are responsible for the "messy" ones. As for the "clean" formations, our opinion is that their origins are unknown because it is highly unlikely that humans are responsible. The "Chilbolton Code" formation is one of the 'clean' types, which indicates to us that its origins are unlikely to be human and therefore unclear. 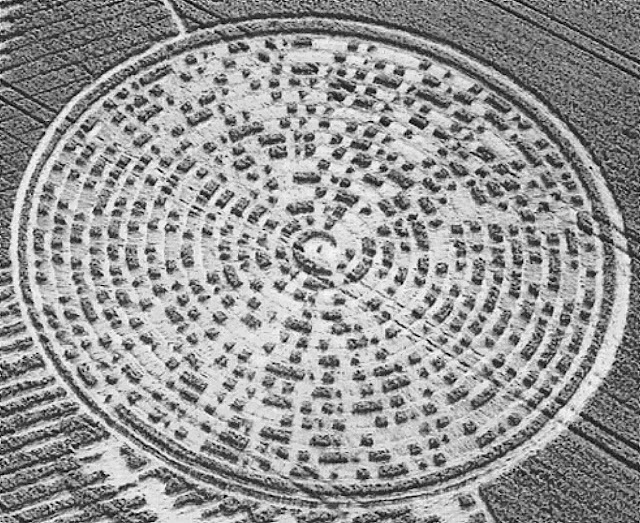 Nevertheless, this is one of the few crop formations where we know it is, in fact, a communication of information and not just an interesting and pretty design, and furthermore, the message format is one we know how to decode. The human has been modified into a figure that, while humanoid, has a far larger head. The building block elements now include Silicon, atomic weight 14, in addition to the original elements listed. There is now an extra strand on the right side of the DNA double-helix, and another, less obvious, change is in the binary coding of the number of nucleotides in DNA itself (in the center). The human genome has 4,293,917,614, or nearly 4.3 billion nucleotide sequences, while the mystery genome sequence shown in the Chilbolton Code has 4,294,966,190, or 1,048,576 (one million) more nucleotide sequences than human DNA. The presence of Silicon in the list of important life-related elements is very interesting. The use of the same basic nucleotides suggests that we are related, or that there are a limited number of combinations of things that actually work well, or perhaps both. The humanoid figure suggests that the senders of the code are not unlike what thousands of reliable persons have reported seeing--the classic "alien" figures commonly referred to as "The Greys." The apparent size of this being is 3'4", if one uses the same mathematics that was used in the original transmission, which also is a match to the information about the Greys. The diagram that depicts our solar system has been replaced with another that still has nine worlds, but planets 3 through 5 are lifted, and the last is drawn larger than the others or perhaps represents multiple moons. The difference in the Solar System information could indicate one of two scenarios. Either it still refers to our own Solar System, but in addition to highlighting Earth is also highlighting the fourth and fifth planets - Mars and Jupiter. Of course, the additional highlight on the 'fifth planet' could actually refer to the asteroid belt which lies between Mars and Jupiter and is in reality the 'fifth element' from the sun. Alternatively, it might not correspond Sol System at all, but to the ET's star system - which would also appear to consist of nine planets...although the sun is depicted as slightly smaller. Decoding the 'population' binary sequence gives a value of approx 21.3 billion - a lot bigger than the original transmission, and indeed Earth's current population. Perhaps this is the population of their own planet, or the combined human and ET population of Earth - if you believe, like some researchers, that Earth is already populated by an unseen ET contingency. If you assume that the alterations to the 'Solar System' section in the crop formation refers to a different star system altogether, then this could indicate the combined population of the inhabited planets of that system. The above is is graphical data only; the transmitter size number data directly below the graphical representation have been deliberately left out. It looks like no known transmitter array...but it does very much resemble something else. 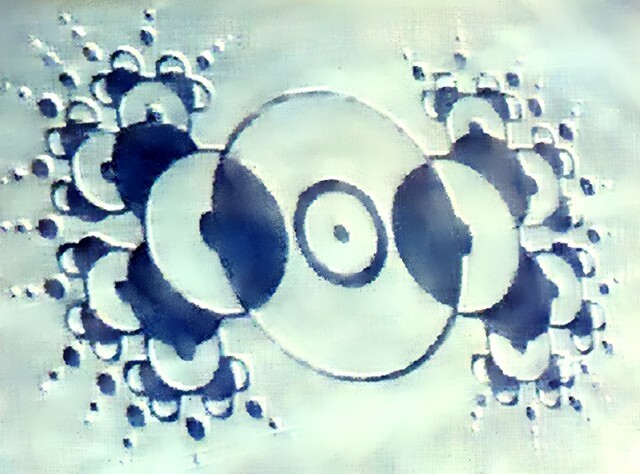 In 2000, a year before the appearance of the Chilbolton Code formation, a symmetric pattern of multiple interlocked circles had appeared in that spot. 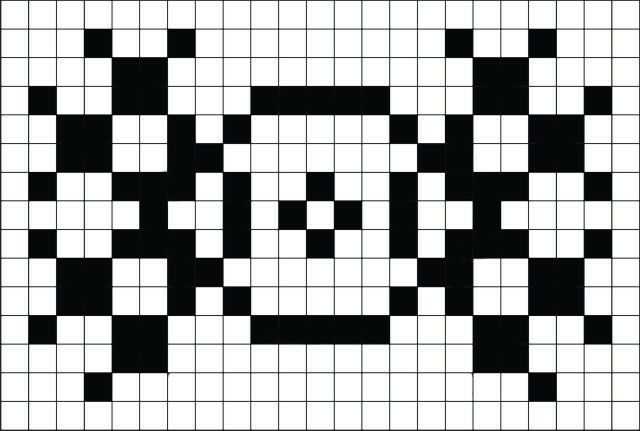 Some thought it was merely crop grafitti, but in light of the possible interpretation of the Chilbolton Code, it may be important to observe that in the same place where the Arecibo signal had a representation of the instrument we used to broadcast the signal, the Chilbolton pattern has a simplified binary representation of something that has very similar characteristics to this 2000 formation. It is possible that the pattern may refer to this design simply because it is a telltale 'mark' of the spot in which the message was imprinted a year later. 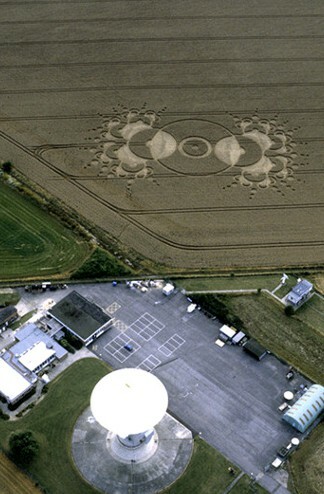 On the other hand, if it is meant to depict the tool used to transmit the message, then this crop circle contains very valuable information, as it may be a representation of a technology or physics concept beyond our knowledge. Perhaps it is even an image of a device that is used for imprinting crop circles...if that is how they are being formed. Just for fun, we here at NCSI took some time to run some effects over a closeup of this crop circle--its been inverted, wildly hue shifted, contrast and brightness enhanced, and mercilessly attacked with a smudging tool--in attempt to create a visual environment in which this pattern of overlapping circles can be more readily grasped as a three dimensional object, rather than an abstract two dimensional pattern. Whatever it is, it's definitely odd looking. We'll leave the problem of it's actual function and purpose as an exercise for the reader. "The central part of the Chilbolton pictogram shows that a DNA double helix as found on Earth, with 10 base pairs per turn, has been replaced on one side by a novel single-stranded helix with just 6 bases per turn. I had to work hard for several days to discover that the single-stranded helix with 6 bases per turn refers to 2', 5'-linked RNA or DNA, as opposed to the normal 3', 5' variety. This is known to hardly any molecular biologist, and I found out only by making an accurate model. ...There is no other plausible way of constructing a 6-fold helix as indicated. [Published research] shows that 2', 5'-linked RNA will form double helices, but prefers to remain single stranded. [Other research] explores the use of 2', 5' RNA as an antiviral drug; it seems we have been exposed to such strange molecules in the past, and have evolved an interferon-RNAase L system against them." "Recall that origin-of-life experiments in the 1980s by Leslie Orgel, found that RNA would often polymerize into two different forms, namely 2', 5' versus 3', 5'; and it was a mystery to chemical evolutionists why 3', 5' was favored on Earth. Note that many abductees remain ill with chronic fatigue, which generally includes a high level of RNAase L; just as if their immune systems have been activated by contact with 2', 5' RNA. The clear implication is that 2', 5' RNA may represent an alternative system of genetic coding to 3', 5' RNA or DNA as found on Earth; and that the makers of the Chilbolton pictogram wished us to understand that fact. Whether a secret band of elite scientists could hoax such a result seems doubtful; since 2', 5' nucleic acids are mentioned rarely in the literature, and nowhere does it say that they form a single-stranded helix with 6 bases per turn. That I found only recently, by painstakingly constructing an accurate model." So there is significant, scientifically verifiable content in the Chilbolton Code formation that is unlikely to have been placed there in the dark by pranksters because the information is new and almost unknown. Perhaps Silicon is involved in the process by which the genetic encoding choice is made. It plays a role somewhere. Clearly there is room for much more serious thought here, if one is so inclined. ....or in this case, "keep watching that field," because in 2002, a year after the Chilbolton Code formation, another clear message was imprinted in the field. This is another "clean" formation that was created in a single night in complete secrecy--the incredible intricacy of the design and the size of the formation indicates that it would have taken a coordinated effort of a large group of people to complete in a four to six hour window of time, without using any visible lights or making any noise, and approaching and leaving the field unnoticably, with no line of vehicles coming or going or parked alongside the field...not to mention using a technique that somehow refrains from killing the crops that are folded down. The picture of the being is a much clearer representation of the classic "Grey" alien. But what is most interesting is the disc part of the formation. Make of that what you will, dear readers. In related news, the Ohio State University Radio Observatory, affectionately known as "Big Ear" and the receiver of the "Wow!" 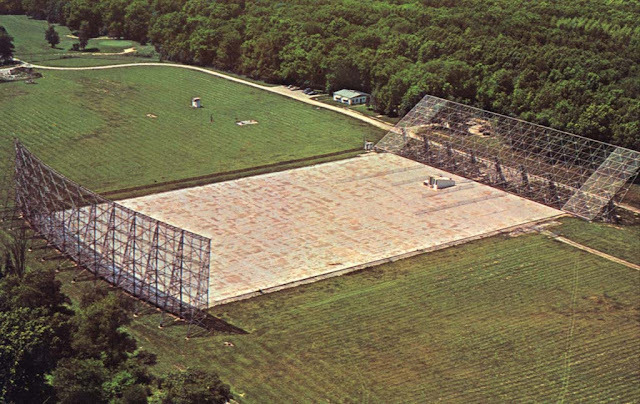 signal, having been in operation for 35 years since 1963, was decommissioned, disassembled, dismantled, and otherwise destroyed in 1998 to make room for the expansion of a nearby golf course. So exploring the physics of the universe with radio astronomy and listening for aliens has been replaced by plaid pants, polo shirts, and golf claps. A worthy exchange? You decide. NCSI Online. Powered by Blogger.